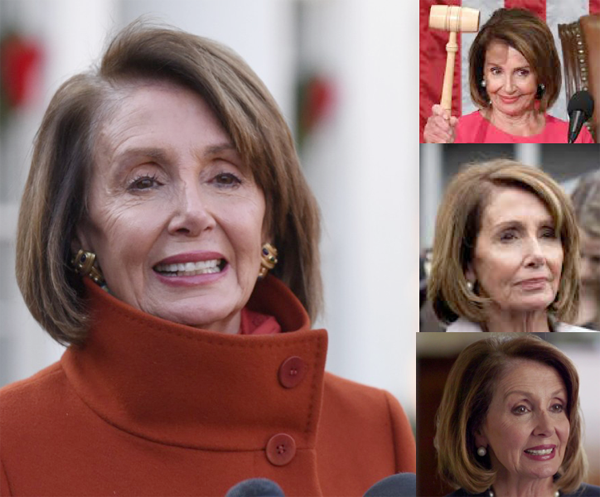 Posts Tagged "Nancy Pelosi Hair"
Home » Posts Tagged "Nancy Pelosi Hair"
Your hair has never looked better and the current bob certainly looks better than that those tired-looking all-the-same “Real Housewife” do’s on the other side of the White House. After scrolling through zillions of Nancy’s on a Google Search, I do think this is the right length for you, it is not too bouffant, as you have worn in the past, or too long, too short and too old-fashioned aging, all your past no-no’s. The color can go too dark sometimes, the highlights too tramline unnatural looking and it could be a little warmer. You have experimented with less layers, more layers and almost but not quite solved the layer problem – how to avoid the hair falling-over-your- face, or having to go behind the ears for you to see. You are nearly there. But sometimes the styling lets you down. It is not always modern, or meticulous, a perfectly finished base, before the hair can be made to look more natural, less perfect and blow in the wind well. Of course, hair blowing in the wind can look a mess on tv and in photos for the Speaker of the House. It isn’t easy as you conquer the forever young look as you have, especially in that Max Mara red coat. Whatever, we wish you every success in taming the untamable.